UNAC/UHCP celebrated 30 new scholarship recipients in early October at the UNAC/UHCP scholarship banquet held during the 2016 UNAC/UHCP convention. Local recipients were celebrated for their academic and professional accomplishments. This year’s winners were selected in a blind review of applications in March. Over 20 UNAC/UHCP former and current members reviewed the phenomenal accomplishments of a strong class of applications, scoring each application on a range of criteria including academic and professional promise. We thank all the volunteers who came out to make our scholarship review day a success. 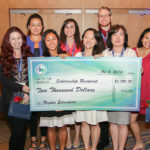 This year, the scholarship banquet celebration was moved to the convention in order to allow affiliates to help fete the winners. Below is a full list of 2016 recipients. ©United Nurses Associations of California/Union of Health Care Professionals, NUHHCE, AFSCME, AFL-CIO.